1University of Concepción, Faculty of Environmental Sciences, Department of Aquatic Systems and Environmental Sciences Center EULA-Chile, Concepción, Chile. 2University of Murcia, Regional Campus of International Excellence, Mare Nostrum Campus, Faculty of Biology, Department of Ecology and Hydrology, Murcia, Spain. Fire is a phenomenon inherent to natural forests, but the management model for forest plantations may increase its frequency and intensity, since it is an important disturbing agent which generates changes in the dynamic that governs the operation of ecosystems and the loss or reduction of many ecosystem services. The main objective of this work is to review the problem of forest fires in Chile with special reference to the Biobío Region, quantifying the loss of some of the ecosystem services caused by this phenomenon. The results show that on average during the last ten years, the Biobío Region has become the largest national area affected by fires (179.912 ha), confirming that these events are highly correlated with forest development (r = 0.5; P < 0.05), amounting to 50.7 % of the national total. Due to limited knowledge on the effects of fires at the local level, results are discussed in the context of direct losses of ecosystem services, particularly the effects in the atmosphere (CO2 emissions and biomass), stressing the importance of the conservation of native forests as absorption systems for the effects of fire. El fuego es un fenómeno consustancial con los bosques naturales, pero el modelo de gestión y manejo de las plantaciones forestales puede incrementar su frecuencia e intensidad, convirtiéndose en un importante agente perturbador que genera cambios en la dinámica ecológica que rige el funcionamiento de los ecosistemas y la pérdida o disminución de muchos servicios ecosistémicos. El principal objetivo de este trabajo es revisar la problemática de los incendios forestales en Chile con especial referencia a la Región del Biobío, cuantificando la pérdida de algunos de los servicios ecosistémicos provocada por este fenómeno. Los resultados muestran que en promedio durante los últimos diez años, la Región del Biobío ha alcanzado la mayor superficie nacional afectada por incendios (179.912 ha), constatando que dichos eventos están altamente correlacionados con el desarrollo forestal alcanzado en la región (r = 0.5; P < 0,05), que equivale al 50,7% del nacional. Debido al escaso conocimiento de los efectos de los incendios a nivel local, los resultados se discuten en el contexto de las pérdidas directas de los servicios ecosistémicos, particularmente los efectos en la atmósfera (emisiones de CO2, destacando la importancia de la conservación de los bosques nativos como sistemas amortiguadores de los efectos del fuego. In recent decades, forestal ecosystems have undergone a rapid transformation as a result of various human activities (Costanza et al. 1997). Phenomena such as deforestation, mining, agriculture, climate change, desertification, and increased forest fires have put biological communities and the services provided by ecosystems at risk (Vidal et al. 2013). In this sense, the benefits that people obtain from nature (ecosystem services), and especially from forest ecosystems, are undeniable (Max-Neef 1991, Turner 2000) Regulation (e.g., CO2 emission and capture) and Recreation, among others. When an ecosystem is altered, many of these services are affected, causing significant changes in ecological dynamics, acting as modifying agents both locally and globally (Hobbs & Harris 2001), with linked events such as the replacement of native vegetation by Agriculture and exotic landscape plantations modify the hydrological and biogeochemical cycles, the atmospheric composition, the global carbon cycle and cause the loss and / or deterioration of various functions and ecosystem services (Thonicke et al. 2001). In the case of forests and forest landscapes, the effects have not been well studied and present many challenges of understanding and responses by the institutions (Spies et al. 2014). In Chile, areas degraded due to deforestation and/or expansion of forest plantations have increased in recent years with significant economic benefits, but with serious contradictions. On the World Day to Combat Desertification, a specimen of Sophora toromiro (Phil.) Skottsb. (toromiro), a legendary endemic and extinct species from Easter Island, was planted in the gardens of the National Congress. Thus, the Corporación Nacional Forestal (CONAF) maintains a garden with the aim of controlling erosion in Rapa Nui. Interestingly, the loss of this unique species has its history in the first fires that caused soil loss and desertification of the island more than 50 years ago, which brought about the first reforestation program with exotic species (Espejo & Rodríguez 2013). Fires are part of the dynamics of nature (Mataix-Solera et al. 2007, Pausas 2012), and in this regard, Flannigan et al. (2003) indicate that low-intensity fires promote herbaceous vegetation, increase nutrient availability, diversify the landscape, and have a positive influence on different physical and biological processes. It’s now generally accepted that periodic low-intensity, controlled, fuel- reduction burns are an important part of the management of natural forests, not only as a means of reducing the danger from high-intensity fires but also for ecological reasons (Landsberg & Waring 2014). However, the reality is that natural systems are no longer affected by fires of little impact, since most of the neighboring vegetable surface or that which surrounds them is formed by forest plantations. These forest plantations accumulate an important load of fuel that is likely to be affected by catastrophic fires. In such conditions, any fire will be high-intensity, causing what is known as a firestorm, which creates its own environment of temperature, humidity and winds, and with unpredictable characteristics, making it very difficult to quantify its impact on affected natural resources. This paper reviews and discusses the occurrence and consequences of forest fires in Chile, with an emphasis on the Biobío Region. Specifically: a) compares the ecosystem services provided by forest plantations and native forests, b) quantifies the losses in the market of some ecosystem services (biomass (energy) and CO2) and c) carries out a first approach to economic damages resulting from the loss of some goods and services of these ecosystems. The study area corresponds to Biobío Region, located on the southern edge of Chile’s central zone (36º 00’ - 38º 30’ latitude South). This has a surface area of 37046.9 km2, representing 4.2 % of the national territory. Much of the surface area of this region corresponds to the Biobío River basin, which represents the natural base of one of the country’s most important centers of economic development. The most relevant productive sectors and dynamics correspond to the forestry sector (including cellulose and paper), agricultural sector, industrial sector (metallurgical, chemical, refinery of oil and textiles), and the hydroelectric sector, which provides the country’s main source of energy. The region is characterized by a Mediterranean temperate climate, which houses 2.052.982 ha of forest. At its northern end, trees such as Acacia caven Molina, associated with Peumus boldus Molina (boldo), Cryptocarya alba (Molina) Looser (peumo), and Quillaja saponaria Molina (quillay) can be found. To the South, remains of sclerophyllous forests are found, where the changes produced by forest pine plantations and by agricultural crops are most evident. This study conducts a review of the increase in forest plantations at the national and regional level (Biobío Region) over the past three decades, as well as its relationship with forest fire records. Information is mainly collected from databases that possess the CONAF, the Wood Corporation (CORMA), and the Forestry Institute (INFOR). The data obtained were correlated (Pearson) and plotted using SigmaPlot v.11.0 (Systat Software, Inc.) software. Similarly, identification of the ecosystem services was performed through a literature review in order to compare those offered by native forests and forest plantations (Appendix), allowing a qualitative approach defined as: + = low contribution; ++ = intermediate contribution; +++ = high contribution, given that there are no quantitative studies on the matter. In the same way, Wood supply losses (provisioning service) and CO2 emissions at the atmosphere (regulating service) were analyzed and reviewed. To calculate the loss of biomass as a source of energy, data were used of areas affected by fires and biomass available to be burned, following the methodology proposed by Valero et al. (2007), (obtaining an approximate value, since not all burned biomass can be extracted for energy use). Subsequent to this biomass value, a correction factor was applied, which corresponds to 0.17 toe/tonne (tonne of oil equivalent) in Mediterranean environments) (Nuñez et al. 2004). Finally, and according to the average barrel value (US $44.05) provided by the International Energy Agency 2016, the value of burned biomass was estimated. MB: mass of fuel available for combustion (tone by ha of dry matter). All fractions are included: biomass, waste, or dead wood. In order to economically measure the CO2 emissions into the atmosphere, the figures were standardized to monetary values (US $), according to what is established by the CO2 emissions market (December, 2016; US $ 6.35 t CO2, http://www.sendeco2.com). Assuming that a plantation or mature forest can achieve a relationship between released O2 and CO2 fixed by the vegetation of 1.2 (Brower et al. 1990), it was possible to quantify the loss of CO2 retention/ha as a result of the fires during the 2015 - 2016 season in the Biobío Region. The calculations were done for four scenarios according to the classification of tree plantation ages established in the CONAF registry. The loss of the future capacity of CO2 capture was also evaluated for the affected areas. To do this, the amount of carbon that would have been captured nationally by plantations was estimated, without the occurrence of forest fires. These calculations were synthesized using the total affected area, multiplying by the CO2 capture value for each species (Eucalyptus globulus Labill. and Pinus radiata D. Don) (Gayoso 2002, Gayoso & Guerra 2005), which also allowed an economic valuation according to the values set by the emissions market as indicated. In Chile, fire is an inherent component to forest ecosystems, whose surge began around the 16 th century upon the arrival of the Spaniards to national territory, who were looking for clear areas to carry out agricultural and livestock activities (Torrejón et al. 2013). The ongoing clashes between colonists and indigenous people, who used fire as a defense mechanism, caused an even greater impact on native forests. However, major damage began during the XIX century with the colonization processes in the Southern regions of Chile (Chilean Patagonia). During this period, the state sought to diminish this devastation, creating the Reglamento General de Corta (general felling rules) (1873) and the Ley de Bosques (Forest law) (1931), although their effectiveness was very low, since the government acted contradictorily, inciting the occupation of forest land for livestock and farming, and encouraging the clearing of forests using fire as a management tool for improving land. Currently, Chile has some 75 million hectares of vegetation vulnerable to fires, between meadows and thickets (41.200.948 ha, 59.5 %), native forest (14.316.822 ha, 33.2 %), and plantations (2.396.562 ha, 7.3 %). The most cultivated species are P. radiata (58.4 %), E. globulus (24.1 %), and Eucalyptus nitens (Dcne.et Maiden) Maiden (10.8 %) (INFOR, 2016). On average, 57 thousand have been burned annually in 5 767 forest fires. 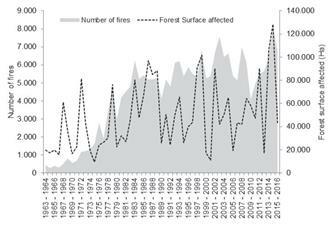 The occurrence of forest fires that affect both forest plantations and natural forest presents important fluctuations beginning in 1964, the year from which official data is made available (CONAF, Fig. 1). Burned surface has increased by 96.4 % in the analyzed series, although the number of fires fluctuates considerably from one year to another, resulting in the maximum values during the period from 2014 to 2015 (8048 fires) and the minimum values during the period from 1964 to 1965 (269 fires). 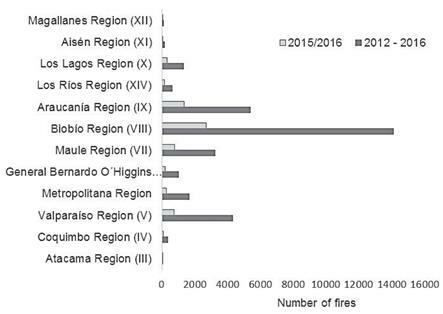 FIGURE 1 Number of fires and forest surface affected nationwide (Source: CONAF 2017). / Número de incendios y superficie forestal afectada a nivel nacional (Fuente: CONAF 2017). In this regard, Fig. 2a shows various fluctuations over the years between the number of fires and forest plantations at the national level. However, a positive relationship has also been observed between these two variables, which is the most significant in the Biobío Region (r = 0.5; P < 0.05) (Fig. 2b). Thus, the Biobío Region makes up the greatest amount of surface area with forest plantations (38 %), dominating the monocultures of Pinus radiata (711.358 ha), where in the last five years, the burned surface amounted to 384.067 ha. The occurrence of forest fires is concentrated mainly in Mediterranean climate zones, from the Valparaiso to the Biobío Region, and although the accident rate of the land increases its extension and danger, it has also been linked to various social conflicts with indigenous communities, creating the question of intentionality. FIGURE 2 a) Number of fires versus number of forest plantations occurred to date nationwide, b) occurred in the Biobío Region (Source: CONAF 2017). / a) Número de incendios versus número de plantaciones forestales ocurridos a la fecha a nivel nacional, b) ocurridos en la Región del Biobío (Fuente: CONAF 2017). CONAF records indicate that the greatest number of forest fires occurs in the Biobío and Araucanía regions (Fig. 3), where 58 % of forests are forest plantations (INFOR 2016). Fires in these regions are favored by the characteristics of the Mediterranean climate, due to the large concentration of human population, the accessibility to forested areas, and the amount of dry material from wastes resulting from intensive management, creating conditions so that the fires generate a strong economic, social, and environmental impact. Depending on the intensity, duration, and frequency, fire exerts a great influence on the availability of natural resources and on ecosystems (DeBano et al. 1998). However, its effects do not occur in isolation; they are generally associated with other processes that sharpen the impact. Understanding its effects on the different environmental compartments is key to assessing environmental, economic, and/or social cost of losses involving forest fires (Mills & Flowers 1985). In this regard, the information in Chile and the Biobío Region is limited, scattered, and in many cases it has not been evaluated, despite the fact that the region is recognized as a hot spot for diversity around the world (Myers et al. 2000, Figueroa et al. 2013). Native forests are important producers of ecosystem services (Campos et al. 2005, MEA 2005), expressed in various goods (firewood, timber, fruits, medicinal plants, animals, etc.). However, they also perform less-known and valued regulatory functions: stabilizing soils, regulating flows of water and nutrients, purifying and filtering water, regulating the local climate, decomposing organic matter, and preventing natural hazards (Table 1). As forests grow, they absorb carbon from the atmosphere, storing it in their tissues and soils, thus reducing the rate of accumulation of carbon dioxide in the atmosphere and mitigating global warming. Additionally, they help to moderate climate change locally by regulating rainfall patterns. The cultural services that they offer (hunting, landscape, fauna, hiking, etc. ), although less-studied, are equally important key activities that contribute to human well-being. On the other hand, forest plantations are systems managed to provide a single ecosystem service (wood and cellulose): key products for the economy. Thus, they tend to be dominated by one or a few species of trees and manipulated to maximize timber production. As a result, landscape homogenization occurs, a decrease in the floristic and structural diversity, and a loss of value as a genetic reservoir. Maintaining this service requires significant amounts of water (Little et al. 2009). However, the plantations are also temporary containers of carbon (due to rapid tree growth) and can help to mitigate climate change when properly handled (Guariguata 2009). Equating the forest ecosystem with forest plantations, in terms of its ability to provide ecosystem services, has led to erroneous decisions in management of the territory, with the consequent loss of its value, by quantifying ecosystem services exclusively with market prices. In contrast, the quantity and diversity of services that the native forests provide are not perceived by most of society and many of them are not assessable in economic terms (Costanza et al. 1997, Nahuelhual et al. 2007). FIGURE 3 Number of forest fires occurred regionally during the last five years (2009-2013) and the last year (Source: CONAF 2017) / Número de incendios forestales ocurridos a nivel regional, durante el último quinquenio (2009-2013) y el último año (Fuente: CONAF 2017). TABLE 1 Qualitative valuation of some ecosystem services provided by native forests and forest plantations / Valoración cualitativa de algunos servicios ecosistémicos proporcionados por bosques nativos y plantaciones forestales. (+) low contribution; (++) intermediate contribution; (+++) high contribution. Source: Daily 1997, Campos et al. 2005 and MEA 2005. / (+) baja contribución; (++) contribución intermedia; (+++) alta contribución. Fuente: Daily 1997, Campos et al. 2005, MEA 2005. In quantifying the damage caused by forest fires, losses inevitably are associated with the timber products obtained from plantations. In this sense, Chile is a country that sustains part of its economy, exporting about 70 % of what it produces, especially cellulose, driftwood logs, pulp, and lumber, almost exclusively of P. radiata. The use of biomass as an energy source has gained more importance in different markets. When considering biomass burned by forest fires in the Biobío Region and it is quantified as energy-producing biomass, a total of 27 million tonnes of dry matter become available for combustion (approximate value, since not all biomass can be extracted for energy use) (Table 2). If a correction factor is applied to this biomass, which in Mediterranean environments corresponds to 0.17 toe (tone of oil equivalent, Nuñez et al. 2004), the energy content of the total biomass would amount to 4.6 million toe. According to the International Energy Agency, the calorific value lost during the 1984 - 2016 season would amount to 33 million barrels of oil. If the average value per barrel is US $44.05, biomass loss would reach US $1,444 million. One of the main ecosystem services provided by forests is their ability to store carbon, which helps to cushion the effects of climate change. However, one of the main consequences of forest fires is increasing air pollution and CO2 emissions into the atmosphere, which contributes to global warming. This air pollution is caused by the emission of gases such as NH3, N2O, NOy NOx, hydrocarbon solids, liquids and gases, aldehydes such as formaldehyde, acrolein, formic acid, and small particles, which have not been fully identified (Johnston et al. 2012). Furthermore, the hydrocarbon present in the atmosphere leads to reactions that impede the elimination of ozone, formed by scattered smoke. Not only do the fires contain particles of carbon and ash, but they are also natural sources of trace elements released and transported into the atmosphere. Medium-sized particles (5 - 10 μ in diameter) may remain suspended in the atmosphere until they are washed by rain, while smaller 2 - 3 μ penetrate deep into the lungs, affecting human health. CO2 emissions have been quantified in various fires around the world; however, there are currently no studies of this kind specific to Chile. In this regard, the overall national results for all ages of plantation forests affected by fires between 1984 and 2016 (Table 3), show that over 37 million tonnes (t) of CO2 (US $ 235 million) were emitted into the atmosphere, of which 53 % (19 470 966 t) come from fires in Chile’s Biobío Region (US $ 121 million). In relation to the scenarios of the proposed ages (Table 4), quantification of the loss of CO2 retention shows evidence that the most critical scenario corresponds to 23 year old pine plantations (E3), which due to increased fire frequency, contribute higher average CO2 levels, with a negative balance of O2 release (ca. : -145 Mg ha-1 year). TABLE 2 Estimation of the biomass in burned forest plantations, Biobío Region (period 1984-2016) / Estimación de la biomasa en plantaciones forestales quemadas. Región del Biobío (periodo 1984-2016). Note: AS: Affected surface (a): 0-10 years, (b): 11-17 years, (c): 18 years; BA: Biomass available for combustion (a): 0-10 years, (b): 11-17 years, (c): 18 years, TB: Total biomass (a): 0-10 years, (b): 11-17 years, (c): 18 years. Calculated according to Valero et al. (2007). / Nota: AS: Superficie afectada (a):0-10 años, (b): 11-17 años, (c): 18 años; BA: Biomasa disponible para combustión (a): 0-10 años, (b): 11-17 años, (c): 18 años, TB: Biomasa total (a): 0-10 años, (b): 11-17 años, (c): 18 años. Calculado de acuerdo a Valero et al. (2007). TABLE 3 Estimation of the emissions of CO2 from forest plantations due to forest fires, according to the study by Valero et al. (2007) / Estimación de las emisiones de CO2 de las plantaciones forestales a causa de incendios forestales, a partir del estudio de Valero et al. (2007). MB: mass of available biofuel, L fuel: amount of emissions of CO2. / MB: masa de biocombustible disponible, Lfire: emisiones de CO2. TABLE 4 Amount of CO2 emitted per surface affected by forest fires (season 2015- 2016, Biobío Region) / Cantidad de CO2 emitido por superficie afectada por incendios forestales, temporada 2015-2016, Región del Biobío. (*) The loss of O2 ha-1 corresponds to the amount in tones of O2 not fixed by the plantation due to burning. / (*) La pérdida de O2 ha-1 corresponde a la cantidad en toneladas de O2 no fijado por las plantaciones debido a la quema. In terms of losses in the future capacity to capture CO2 between 1984 and 2016 (Table 5), the national values correspond to 200 million tones of CO2 (calculated without considering the burning of native forest), which is equivalent to US $ 1 270 million in allowance prices. Similarly, at the regional level, the amount of emissions corresponds to 105 million tonnes of CO2, with a value of US $ 667 million. Unfortunately, there are no data regarding burned native areas, although a study by Chile’s University Austral in the framework of the Global Carbon Project (http://www.uach.cl/procarbono/documentos.html) estimates that the amount of carbon stored over the average lifetime of the Quercus robur L. and Araucaria araucana ((Molina) K. Koch.) corresponds to 560 and 680 tones of CO2 per tree, respectively. TABLE 5 Loss of future sequestration capacity of CO2 from forest plantations / Pérdida de capacidad futura para captura de CO2 por las plantaciones forestales. Sequestration value of CO2 from E. globulus = 581.15 t CO2 ha-1, P. radiata = 90.5 t CO2 ha-1 (7 years), 614.6 t CO2 ha-1 (16 years), 654.0 t CO2 ha-1 (23 years). Source: Gayoso & Guerra 2005; Gayoso 2002. / Valor de captura de CO2 de E. globulus = 581.15 t CO2 ha-1, P. radiata = 90.5 t CO2 ha-1 (7 años), 614.6 t CO2 ha-1 (16 años), 654.0 t CO2 ha-1 (23 años). Fuente: Gayoso & Guerra 2005, Gayoso 2002. TABLE 6 Summary lost by wildfires / Resumen de pérdidas ocasionadas por incendios forestales. (*) Values of emissions were homologated to monetary values (US $), according to the value of the established CO2 emissions, (US $ 6.35 t CO2, December 2016). / (*) Los valores de las emisiones fueron homologados a valores monetarios (US $), de acuerdo al valor de las emisiones de CO2 establecidas, (US $ 6.35 t CO2, Diciembre, 2016). (**) Biomass losses were calculated according to the average barrel price (US$ 44.05) given by the International Energy Agency (December, 2016). / (**) Las pérdidas de biomasa se calcularon de acuerdo con el precio promedio del barril (US$ 44.05) otorgado por la Agencia Internacional de Energía (Diciembre, 2016). The occurrence of forest fires is mainly concentrated in Mediterranean climate zones, from the Chilean region of Valparaíso to the Biobío Region. Although the accident rate of the terrain increases their size and danger, this has also been linked to various social conflicts with indigenous communities, proposing the question of intentionality. The CONAF records indicate that most forest fires occur in the regions of Biobío and Araucanía (Fig. 3), where 58 % of forests are forest plantations (INFOR 2016). Fires in these regions are favored by the characteristics of Mediterranean climate, the high concentration of human population, access to forested areas, and the amount of dry waste material derived from intensive management. Such factors create the conditions that cause fires to generate strong economic, social, and environmental impacts (Peña-Fernández & Valenzuela-Palma 2004). In Chile, the perception of forests as producers of firewood and wood has limited the real valuation of native forests, which joined with productivist economic policies, has helped foster the growth of the forestry sector (Lara et al. 2010a). The result has been an increasing degradation and loss of large native forest areas, replaced by fast-growing species, which has triggered negative social and environmental impacts (Lara et al. 2010b). Many projects developed to control erosion are based on exotic plantations, since native plantations are less intensive and diverse, without having a clear perception of how the change in territory use affects ecosystem services such as the provision of biomass and CO2 capture. The value of the forest as a fixer and carbon storage is well known, although its conceptualization as an environmental service has only appeared when awareness of the role of CO2 emissions in climate change has pushed the signing of international agreements and the implementation of policies to reduce such emissions (Ruiz-Pérez et al. 2007). However, there is no record of indirect effects (impact on biodiversity, loss of water resources, erosion, loss of soil fertility, social and economic impacts). Apart from the impact on the environment, damage affected people and their homes, demonstrated by the Quillón Fire (January 2012), where material losses were valued at more than US $3400 million, not taking into consideration human lives and loss in the tourism sector. After a fire, direct loss (plant mass, fauna) and indirect loss (disturbance of the hydrological cycle, loss of recreation sites) of important resources is produced. In the last 30 years, Chile has recognized damages that border 100 billion USD in direct losses (Urzúa & Caceres 2011). Damages caused to date, whether nationally or regionally, have caused authorities and independents to invest in modern technologies to reduce natural, material, and human losses. In vivo monitoring (unmanned aircraft with GPS control and high-resolution cameras) has been implemented, which enables a real and immediate insight into the coordination of the emergency, anticipating risks and optimizing the use of resources in both extinction and ceasing of the fire (CORMA 2016). Studies carried out by Lara et al. (2009) highlight the importance of differentiating the native forest from forest plantations in terms of provision of ecosystem services. Their results are conclusive in relation to the surface and water production (flow/precipitation), since native vegetation has the ability to store it during the rainy season and release it during the dry season, contrary to what happens with Eucalyptus sp. and Pinus sp. plantations characterized by their high evapotranspiration (Huber et al. 2008). Thus, native forest maintenance is an essential tool to delay the spread of fire in regions where the increase in temperature and drought due to climate change would increase the risk of forest fire (Murray et al. 2013, Livingstone & Varner 2016). Wildfires also constitute an important opportunity for ecological restoration, accelerating natural plant succession and the recovery of degraded systems. In Chile, ecological restoration is influenced mainly by afforestation processes (in places without forestry) and reforestation (in sites with extractive exploitation). The total area afforested in the Biobío Region during 2016 was 461.10 ha, which amounts to 19% of the total forested area in the country. Afforestation was carried out using plants of 12 species (nine exotic: Eucalyptus camaldulensis Dehnh., E. nitens, E. globulus, E. delegatensis F. Muell. ex R.T. Baker, Pinus radiata, Populus alba L. y Populus nigra L., Acacia melanoxylon R.Br., Pseudotsuga menziesii (Mirb.) Franco and three natives: Lomatia hirsuta (Lam.) Diels subsp. obliqua (Ruiz & Pav.) R.T. Penn., Nothofagus alpina (Poepp. ex A. DC.) Oerst., Quillaja saponaria, of which a 46.8% corresponded to P. radiata and 28.4 % to E. globulus. Afforestation with native species only reached an area of 96.97 ha (1.6%), the most representative species being Q. saponaria (59.31%). Reforestation has reached 46 236.20 ha (48.1 % of the country). The number of plants is estimated at nearly 40 million spread over 10 species (seven exotic and three native). Considering this data, it follows that in the Biobío Region; restoration with exotic species is prioritized, obviating the importance of native forests as ecosystems of high environmental and landscape value, and their ability to act as a natural barrier against the spread of fire. Also, despite the low percentage achieved, surprisingly, a typical dry land species such as the Quillaja saponaria would be successful and would likely compete with tree plantations for water resources. In this sense, Lara et al. (2010b) brings to attention the need for amendments to the Native Forest Law and Decree-Law 701, suggesting bonuses for management actions, conservation and recovery of forests aimed specifically at the production of ecosystem services, beyond their importance as generators of market products. 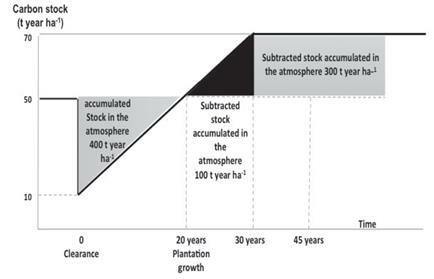 FIGURE 4 Example of the temporary evolution of the accumulated stock of CO2 in forest plantations. Modified from Locatelli & Leonard (2001) / Ejemplo de la evolución temporal del stock acumulado de CO2, en plantaciones forestales. Modificado de Locatelli & Leonard (2001). While it has been shown that forest plantations can be an important reservoir of CO2, the results allow for questioning of the point of equilibrium when they do not reach their maximum CO2 capture due to scheduled pruning and harvesting (P. radiata near 20 - 25 years and E. globulus near 10 - 15 years), and the effect of frequent fires. This is not so in the case of native forests, since there is a more controlled demand for species that reach greater longevity and a higher stock of CO2 accumulate over time (Mackey et al. 2008). Locatelli & Leonard (2001) show that cutting down a forest that stores 50 tonne C/ha (the stock falls to 10 tonne C/ha) and replacing it with plantations will result in storing 70 tonne C/ha after 30 years (Fig. 4). In terms of flow, the operation is beneficial after 20 years since there will be carbon storage. After 30 years, the operation contributes to 20 tonnes C/ha of additional storage. However, for 20 years, the accumulated carbon stock in the atmosphere (around 400 tonnes year/ha) negatively contributes to climate change. After 20 years, the stock accumulated in the atmosphere decreases to 300 tonnes year/ha after 30 years and nil after 45 years. Conversely, a productive activity that generates loss or reduction of these services cannot be subsidized, such as water regulation loss or decrease in CO2 capture, as opposed to other approaches. Forest systems provide important services and economic benefits for the human being, though the pressure associated to forest fires causes that these systems are incapable to provide the amount and quantity of services expected, jeopardizing the expected economic well-being and health of the population. Fires alter the stability of the surrounding natural ecosystems, modifying both structure and composition of native species, affecting successional dynamics, disturbing ecological interactions, and triggering erosive and degrading processes. These factors are translated into a loss of functionality of difficult to recover ecosystems. Among the identified impacts respect to provision services, reduction of timber products and loss of stock of non-timber products are prioritized in this category. Regarding regulation services, the reduction in carbon capture capacity by vegetal biomass is identified. There are other losses that have not been assessed in this study, related to cultural services and export of non-timber products, as well as the cost associated to futures flooding caused by erosion and waterproofing. However, the most evident impacts are those that occur in forest plantations, where the incidence of fires is higher and whose effects can be easily quantified. This study attempts to show an approximation of the losses suffered by the ecosystems with market value. Particularly, results indicate that the economic losses for the Biobío Region, considering all incendiary events recorded to date reach ca US $2 200 million. These costs are mainly related to CO2 emissions, excluding other associated costs (e.g., extinction) where it is possible to reach figures higher than US$3,000 million, which lead to rethinking the way in which this problem of forest fires is addressed. Therefore, it becomes necessary to create preventive, recovery/restoration strategies that prevent fire pressure from degrading the ecosystem functions. Concepts related to fire should be integrated into forestry and land management, strengthening links with surrounding communities in order for prevention purposes, providing incentives that impact the management that prioritize native vegetation over commercial vegetation, based on the functions provided by the native forest, which can be assessed in opposition to the losses of ecosystem services evaluated in this study. In this sense, the implementation of protection strings would achieve the development of a concept we have named “edge effect”, mitigating the effects on both human and natural communities. This measure could be imposed in planning instruments, territorial planning and all management plans or novel prevention plans (Regulatory plans). The results would not only benefit the provision of ecosystem services, but biological corridors would be rehabilitated, favoring the diversity of vegetal and animal species that generate new services. Therefore, having a first approach to the emission of CO2 and the loss of biomass in fire-affected ecosystems opens up a possibility to assess ecosystem services of global interest, which well managed will generate benefits to the community. Thus, the approach must incorporate a territorial design of the landscape that allows compatibility of productive and environmental sustainability aspects in the short, medium and long range. In this sense, the debate on forest fires should be focused on the causes, but also how to minimize consequences, contributing from the corporate social and State responsibility towards public policies of sustainability, in favor of a social equity expressed in a better quality of life provided by ecosystem services. This study was funded by the FONDAP Nº 151300 project (CRHIAM). Thanks to the support of the Doctoral Dissertation Fellowship from the National Commission of Research, Science, Doctoral RED, REDOC MINEDUC Project UC012002 at the University of Concepción and Technology (CONICYT). Thank to Peter Lewes for English revision and commentaries.